In Part 1, I began answering objections from my traditionalist friend regarding the Conditional Immortality view of hell – that the traditional view of Eternal Conscious Torment (ECT) in hell is the wrong understanding of the scriptures, and instead, the view that the unredeemed are annihilated at judgment, and fail to inherit eternal life (hence their immortality is conditional) is correct. Here’s my friend’s initial letter repeated, and my continued response. Let’s start with fire again. Jesus did use it in describing the fate of the unredeemed in a similar passage, so let’s compare the usage and come to a decision about what ‘unquenchable’ fire means in light of both passages. 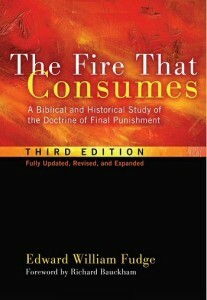 By the way, this is why Edward Fudge named his seminal conditionalist book “The Fire that Consumes” – because not only is God’s fire said to consume His enemies, but to assume a fire that never consumes (like Moses’ burning bush) is so backwards that proposing it is truly a ‘strange fire,’ to borrow a phrase. If we look back again to the ‘eternal fire’ that consumed Edom and Sodom, it is easy to see that unquenchable fire is not fire that burns forever, but that cannnot be quenched prematurely before the fuel is entirely consumed. Regarding undying worms, it is naturally confusing, because it seems like the worms have eternal life! But this can be naturally understood and better harmonized with ‘unquenchable’ as continuing to consume until the corpses are gone. Worms consume DEAD material, by the way, not living things being tormented. Again, the worms don’t die prematurely, just as the fire does not end prematurely. To assume unending fuel or undending bodies for the worms is probably not the first or best understanding of this, ESPECIALLY in light of the consistent and frequent use of the words death, destruction, destroyed, consumed, and perish. Quite honestly, we must either redefine these words to mean ‘destroyed but not destroyed’, or go the other direction and say ‘unquenchable until all fuel is consumed’ and ‘eternal outcome, not eternal process.’ Which harmonization is more likely? Honestly, isn’t it obvious? 4. 2 Thessalonians 1:9, indicates a figurative devastation that the damned will experience forever in hell, separated from the Lord’s royal presence. So suddenly you are going figurative on me? You can be literal in Rev. but not here? BTW, the passage is not clear – does the destruction remove them from God’s presence, or does ‘from his presence’ define ‘destruction’? Certainly, if you are destroyed, you are removed from His presence. But if you are removed from his presence (into eternal torment, which is not mentioned here), is that any kind of literal destruction? NO! As you admit, it has to be figurative since the the person ‘destroyed’ still lives. So I ask again, which perspective makes more sense if you don’t assume eternal torment? Destroyed away from, not away from and therefore destroyed. Again, you make my point. You are taking Revelation literally, which is inadvisable. Why this passage, but not the Lamb, or the 144,000, or the beast, or the whore? As mentioned above, all of these idioms, including ‘forever and ever’ are the IMAGERY, but all imagery must be interpreted, not taken at face value. As I have said, each of the three view (ECT, CI, UR) have passages that on their face seem to support them, and all have passages that seem to contradict. That ‘eternal’ must mean ongoing process when it is clear that there are many examples of it meaning eternal outcome. That the consuming fire of God never actually consumes the wicked. And we haven’t even discussed other problems with the traditional view yet, such as assuming the immortality of the unredeemed soul, or the violation of the Biblical standards of justice, proportional justice (eye for an eye) and mercy, and others.